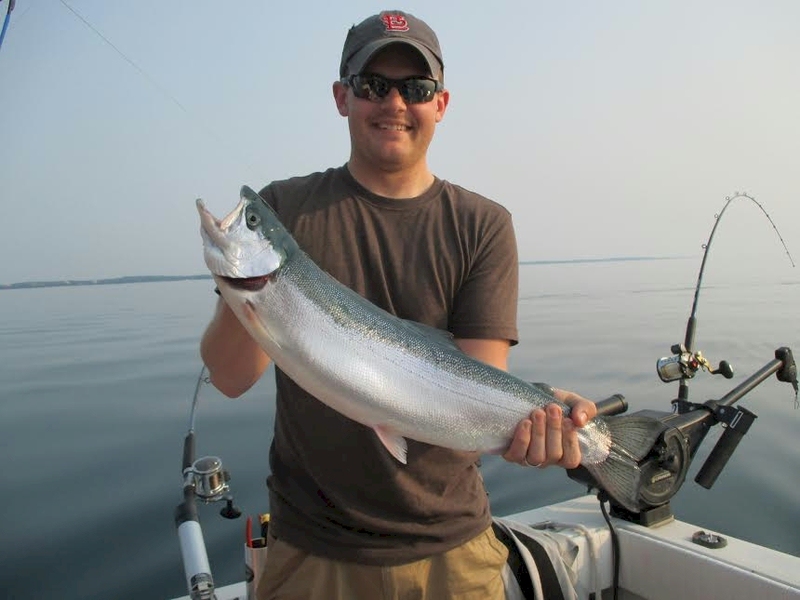 Salmon are King of the lake. Oswego has it all. Shallow water or water. You can be in 600′ in just a short drive if need be. We go where the fish are. 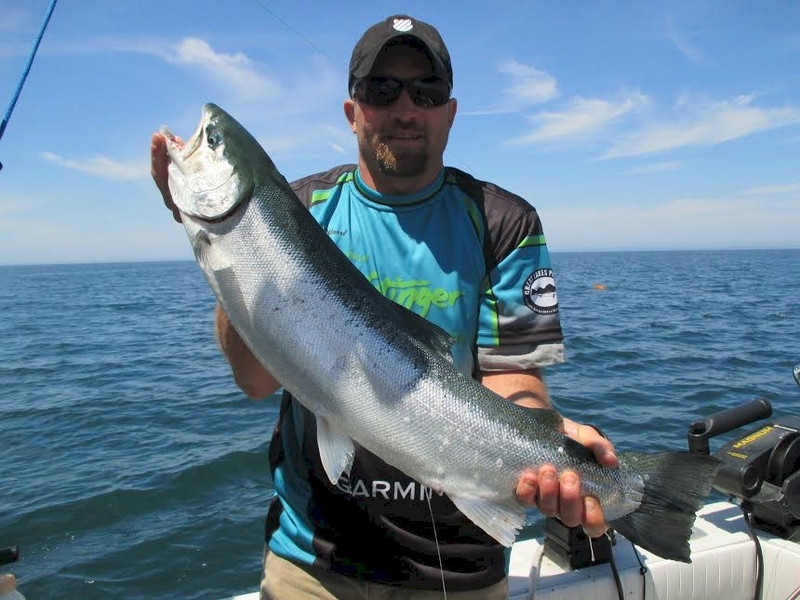 Salmon are rod busting, tackle smashing, line peeling bulldogs. 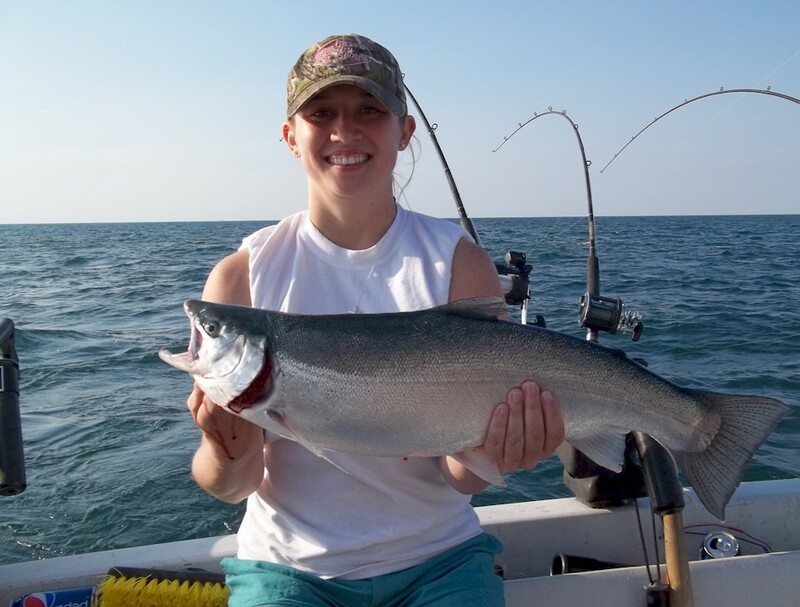 Come catch a fish of a lifetime. 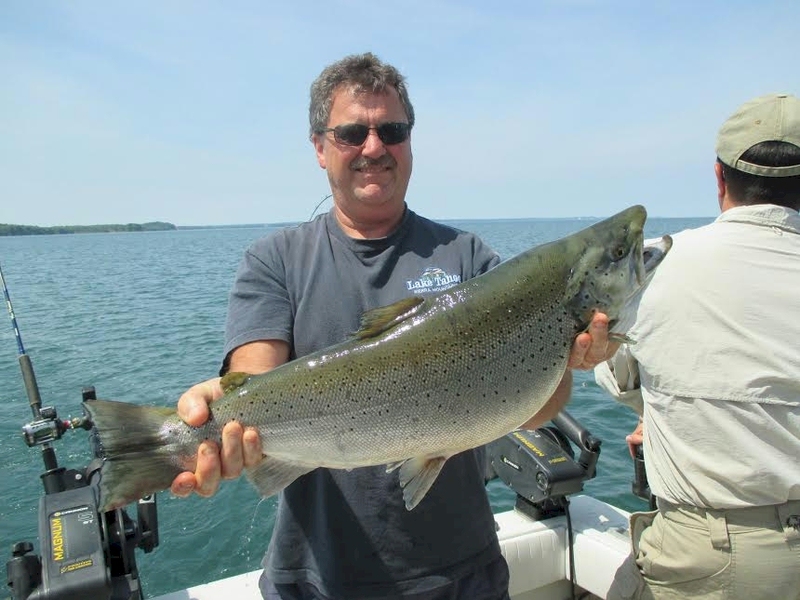 The next Lake Ontario record maybe yours. 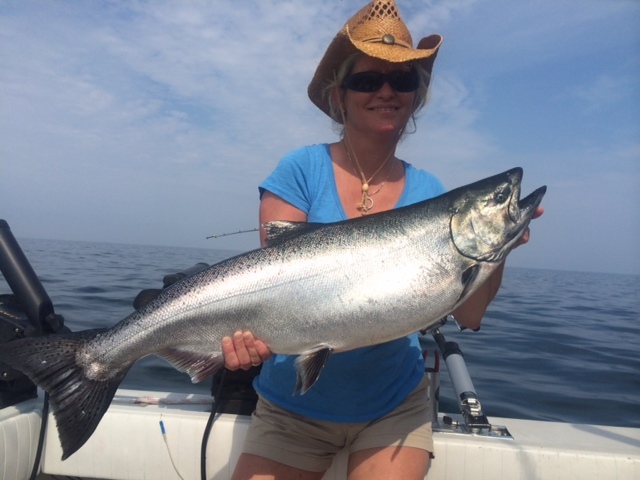 The best time of year to be Salmon fishing is July -September. Come aboard and hear the reels screaming off line. 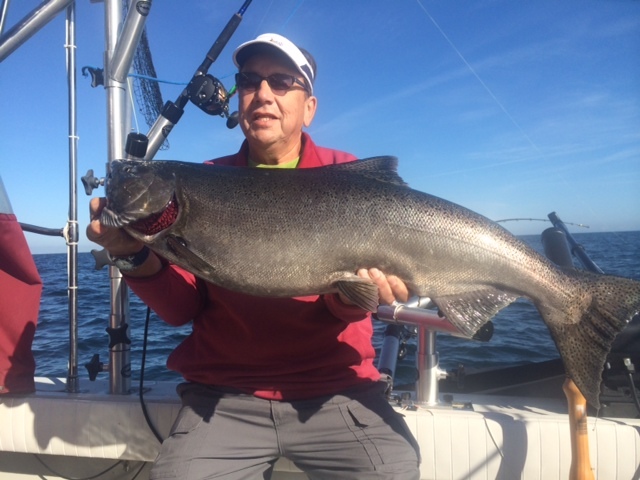 These fish range from 5 to 40 lbs. 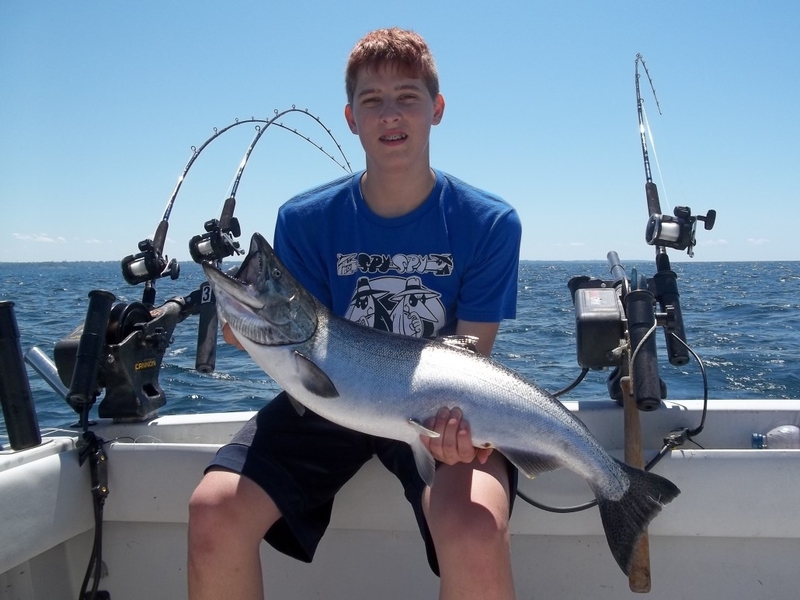 We do many tournaments and derbies ask if there is any going on when you are in town. If you want to practice for this just hook a line to the back of a truck and hang on! 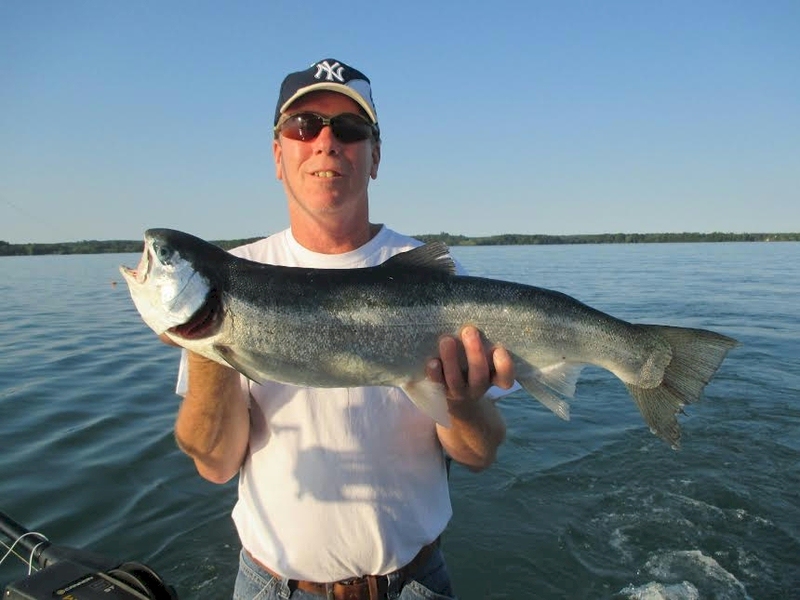 If you haven’t been Salmon fishing on Lake Ontario you haven’t been fishing. 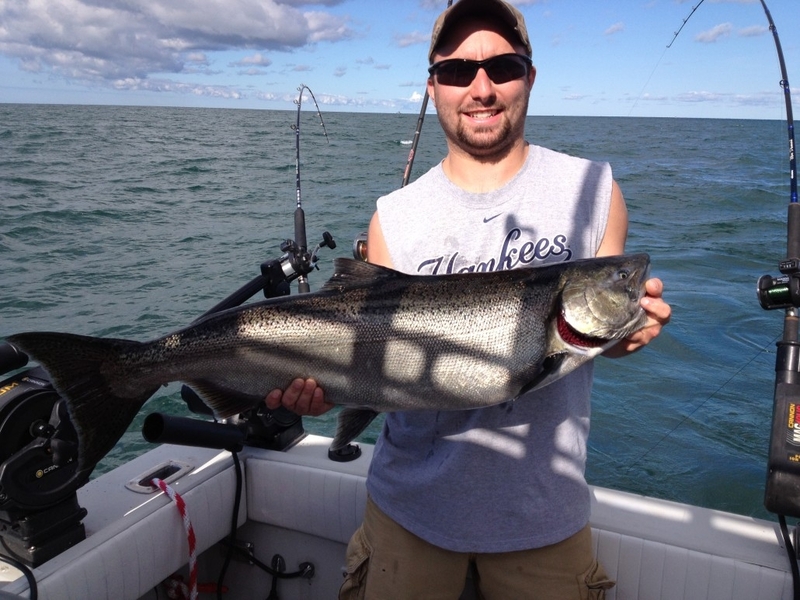 If you have been to Lake Ontario but haven’t been to Oswego you have been missing out. 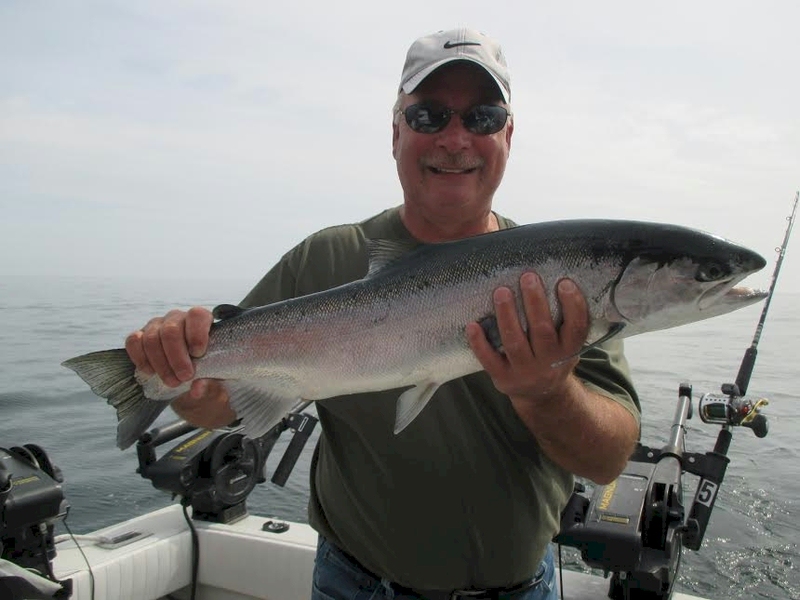 Oswego is Home of the Big King Salmon. 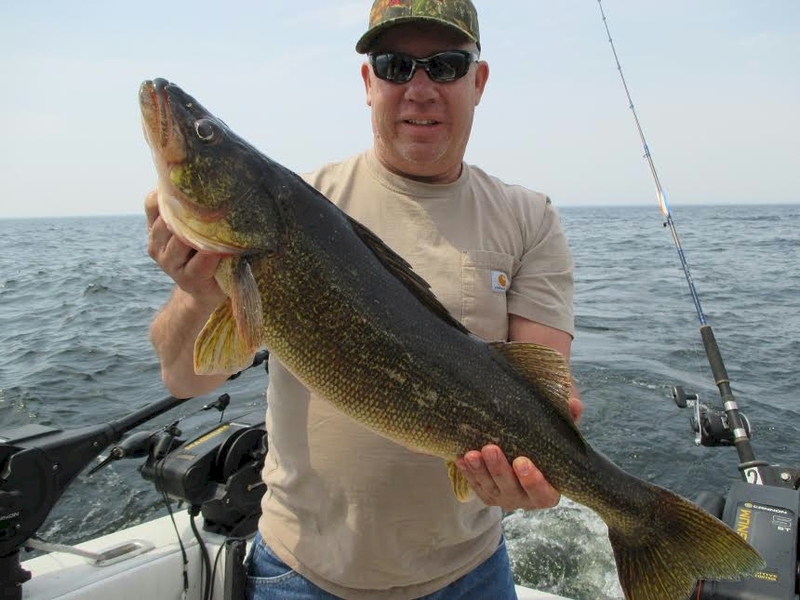 If you are going to walleye fish you might as well fish where the monsters are. 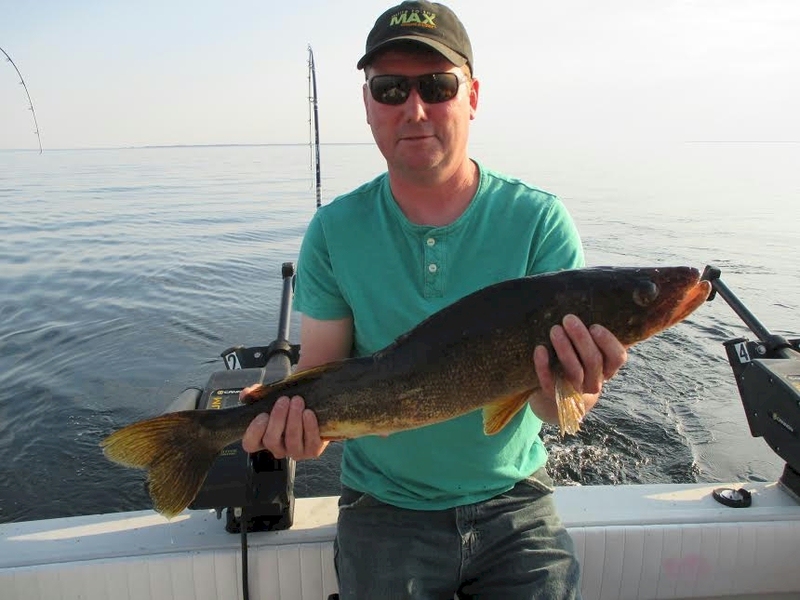 All walleye trips are done out of Chaumont Bay. 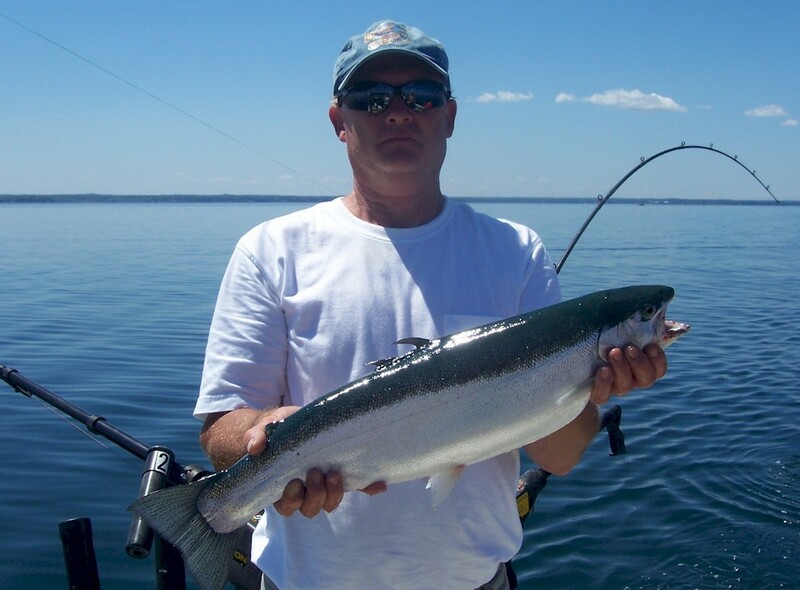 We fish the first 3 weeks of May out of this area. 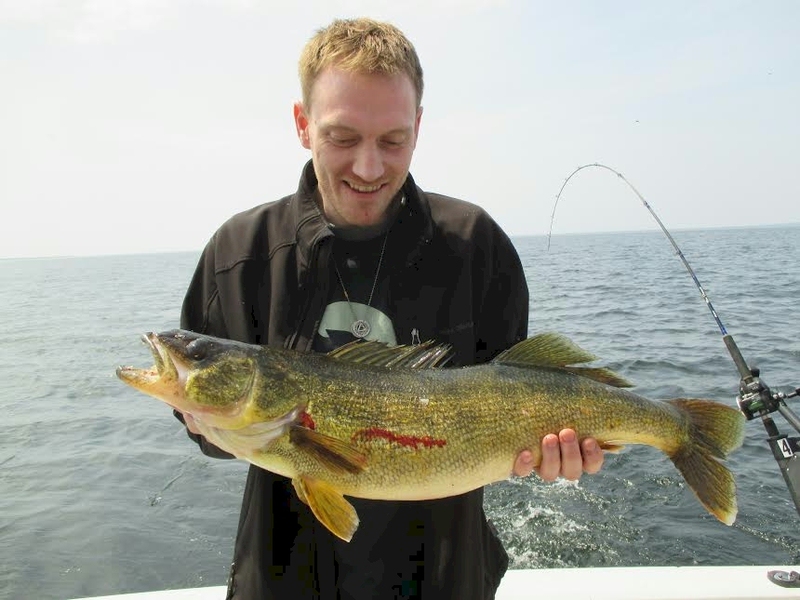 I grew up catching these fish before they became nationally known. 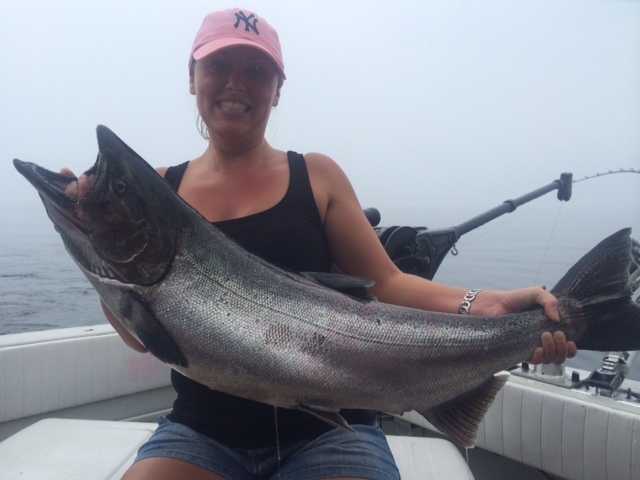 We catch many 10 lb. 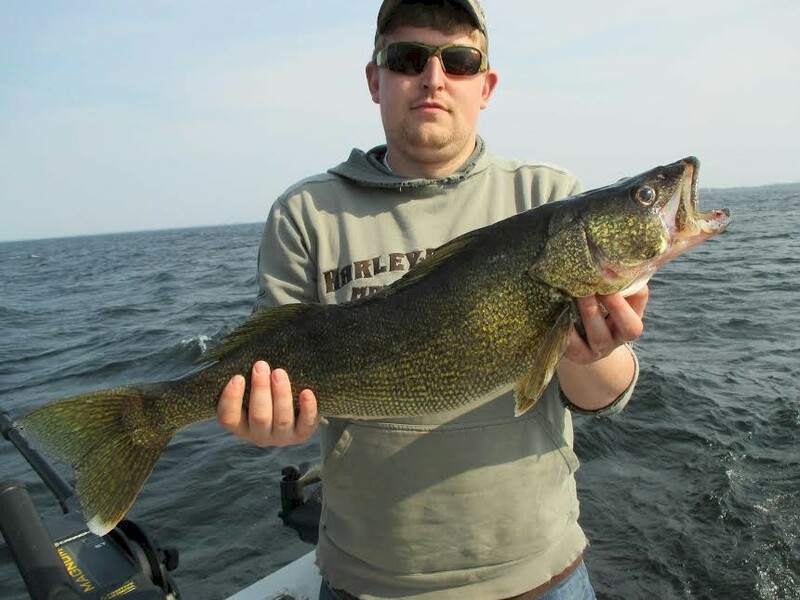 plus walleyes every year. 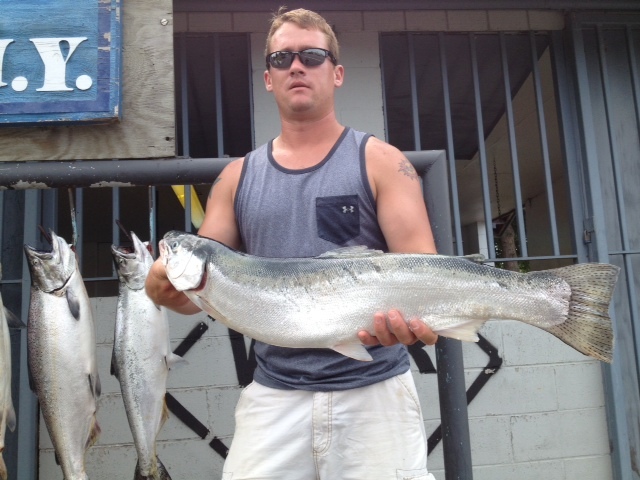 If your looking for a trophy give us a call. All are done during the day these are not night harbor patrol trips. 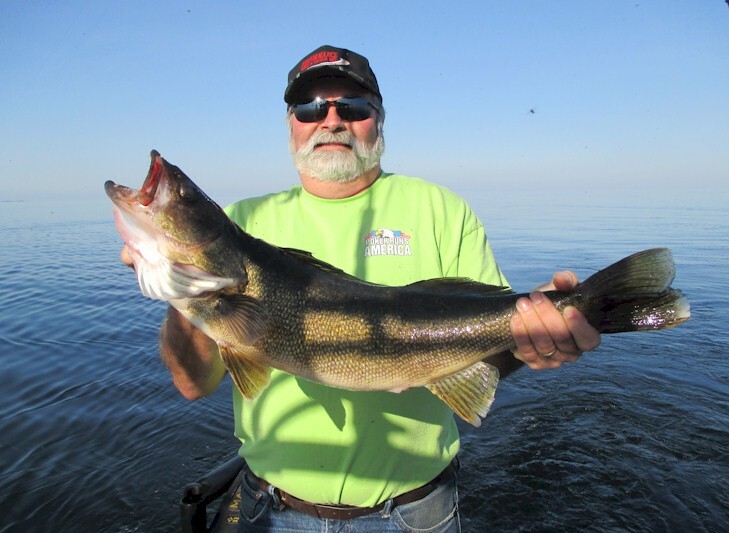 People come all over to country to try for a monster Walleye. We use downriggers and planes. 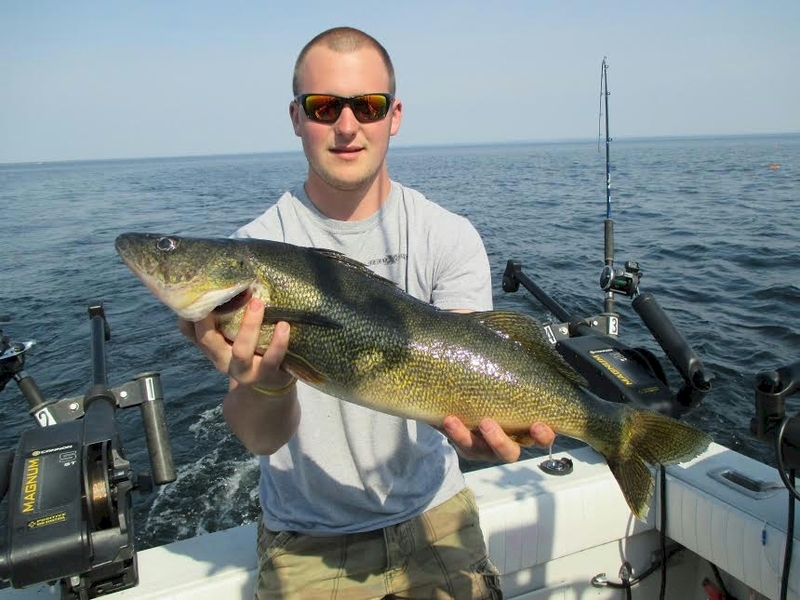 The combo of Michigan stingers and reef runners account for the majority of the fish. If you are interested in one of these trips call and book early most don’t give up these days so there are not many available. 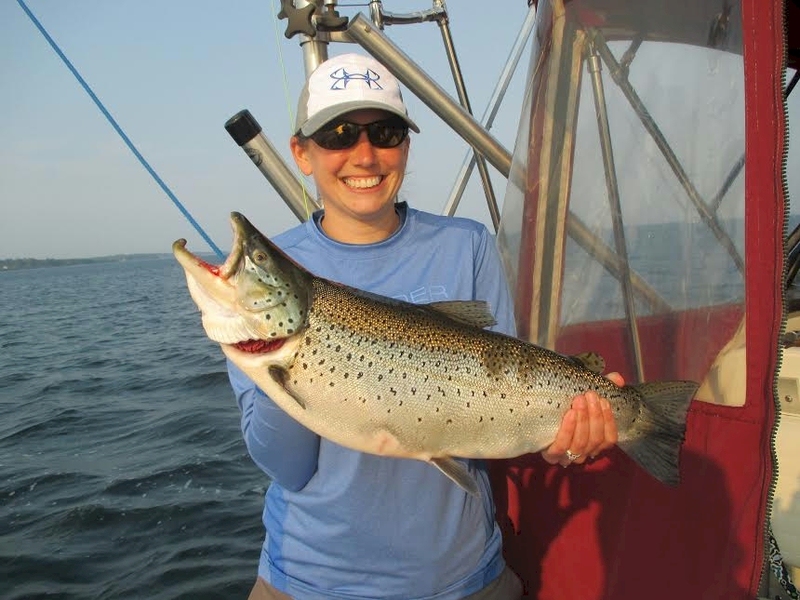 Brown Trout fishing can be over looked. 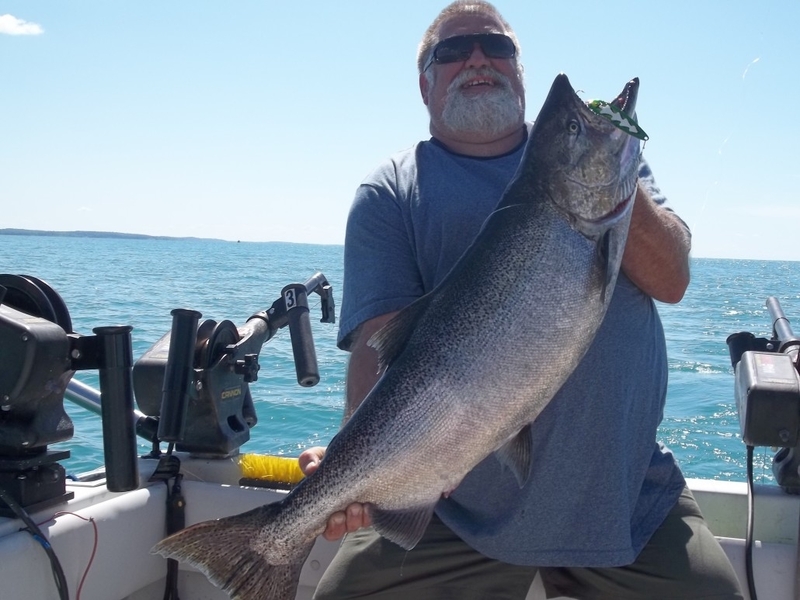 Thought they may not get as large as the Salmon , people come from all over to have their hands full fighting these fish. 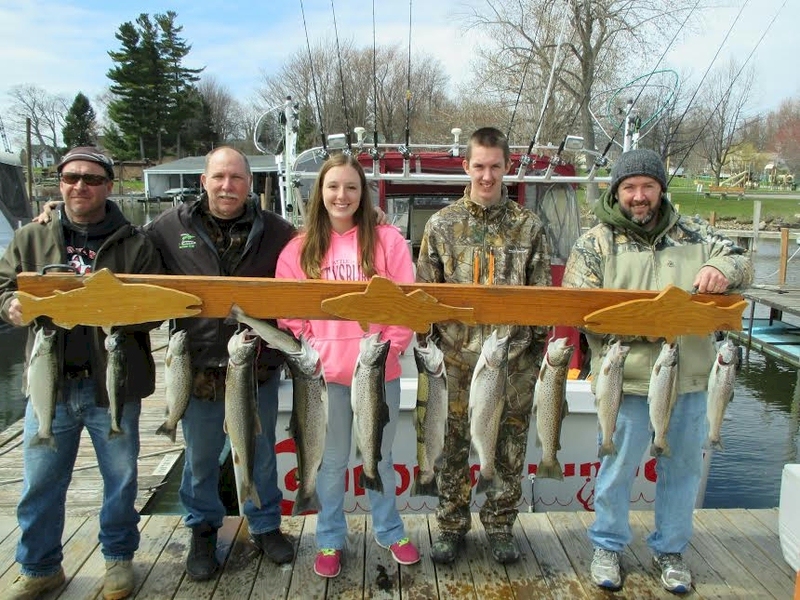 They average brown is 3 to 5 pounds in early spring, quite a few fish are in the 10 to 15 pound. 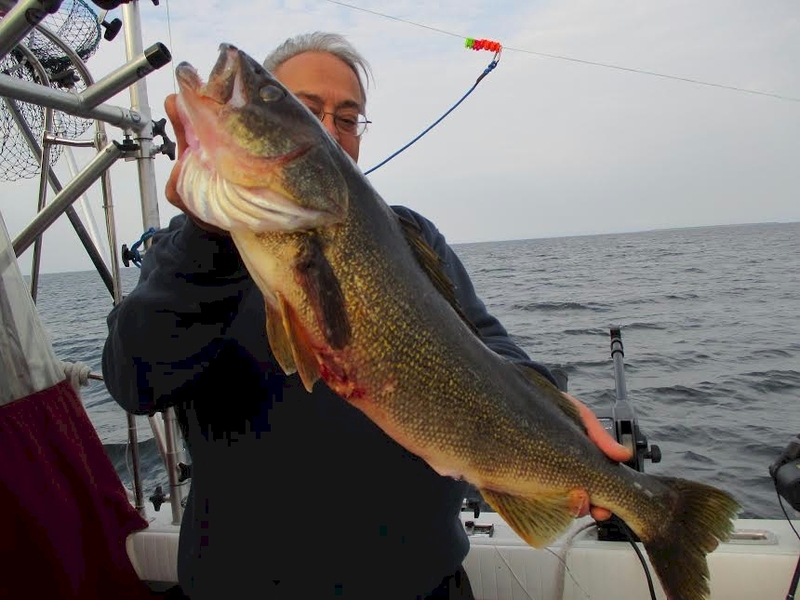 We catch most of our bigger fish when they move off shore later in the spring and early summer. 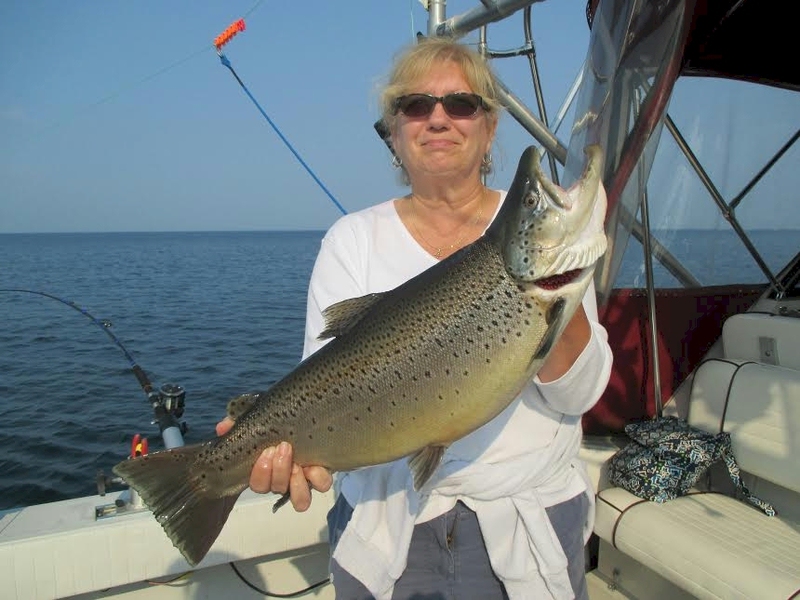 Brown trout fishing remains good to mid July. 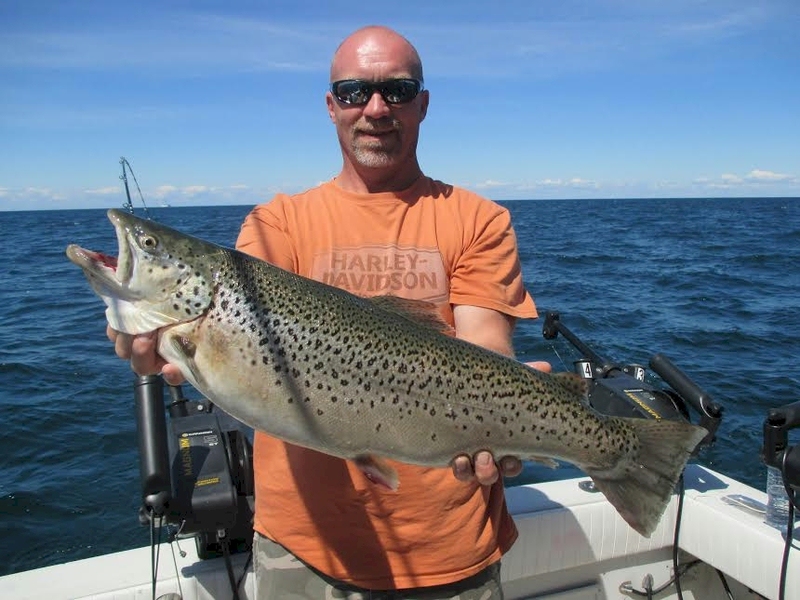 One thing you will notice fishing with us is Browns love Michigan Stinger lures. We will be using light line and light action poles. These are perfect family trips. Take a kid fishing. 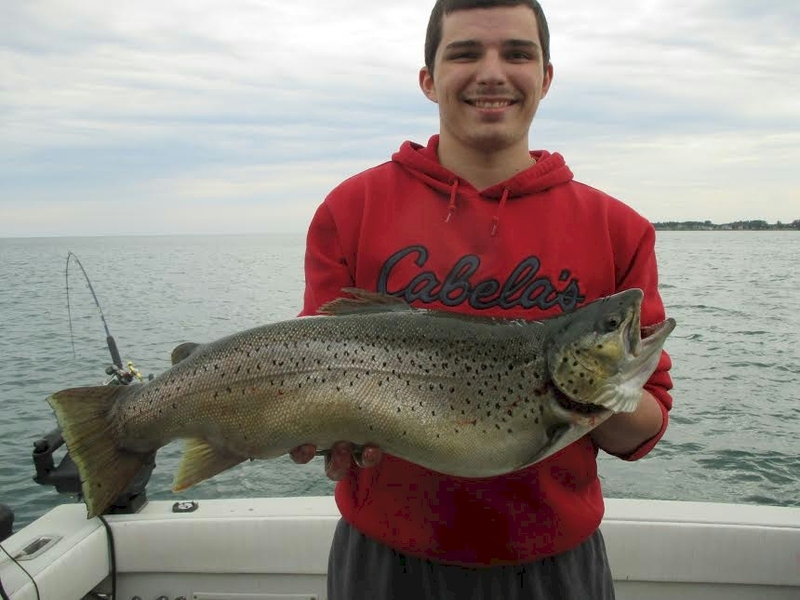 Oswego Catches some of the biggest Brown trout every year. 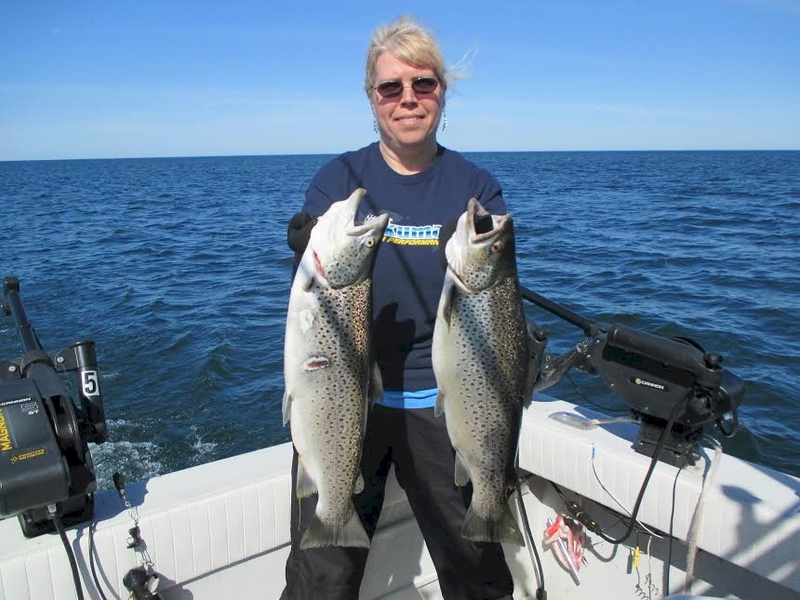 Try Oswego Brown Trout. 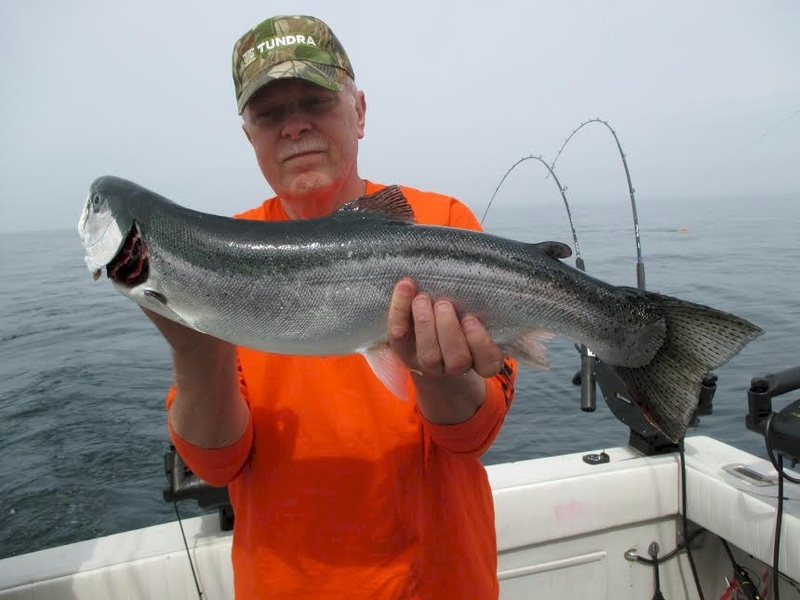 Steelhead you want a fight that’s full of acrobatic moves this fish is for you. 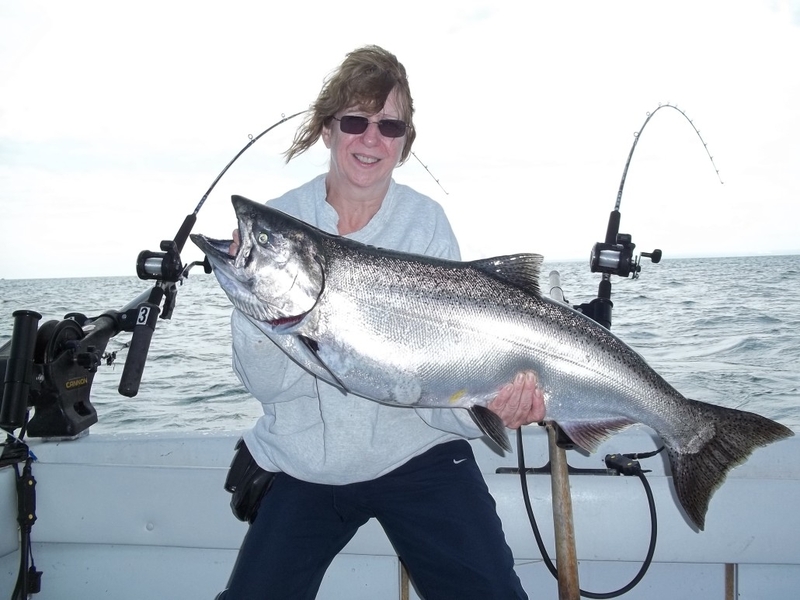 We go off shore to catch a mix of Steelhead and Salmon in July. 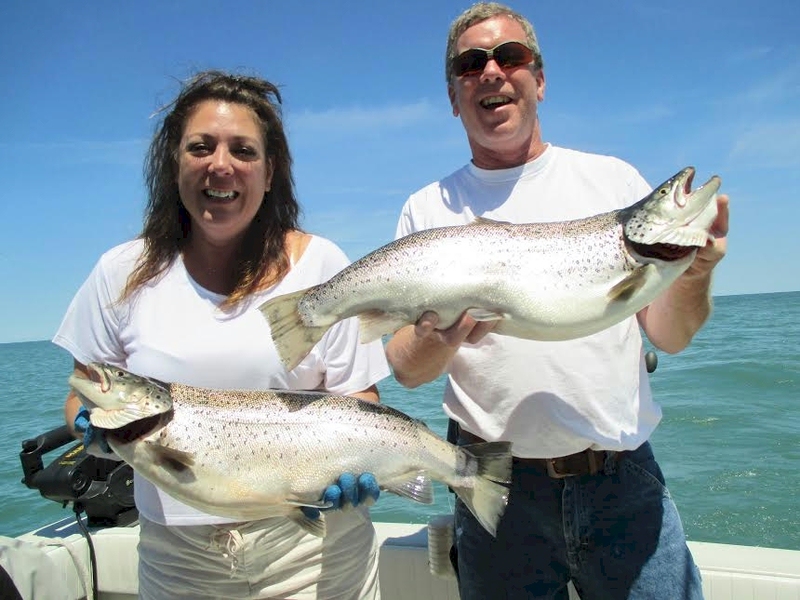 These fish are noted to be doing cartwheels all the way to the boat. You want some excitement in the dog days of summer give us a call. 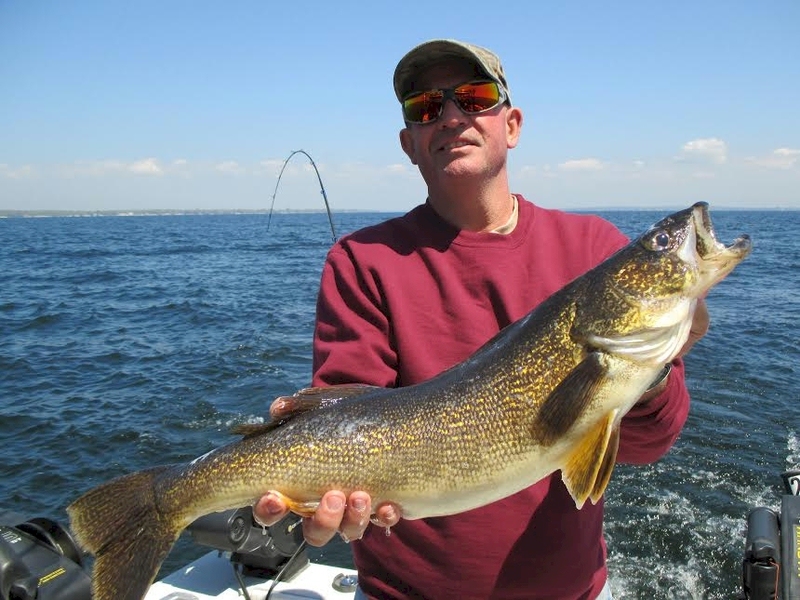 This fishing is done mostly way off shore. We look for the thermocline in water between 200 and 600 feet. The size ranges from 5 to 20 pounds. 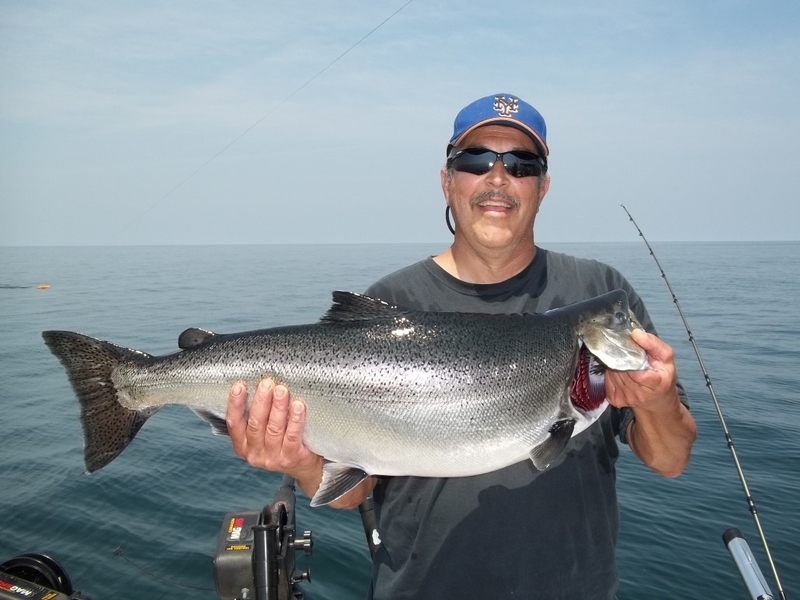 Oswego is one of the few places on the Lake that lets temp setup over water.